It was a year in the making. I actually cut out all the pieces, including the lining, bought all the notions, and made all of the markings a year ago, almost to the day. I began sewing the outer portion but got sidetracked and never finished. Well, here she is, just in time for fall. 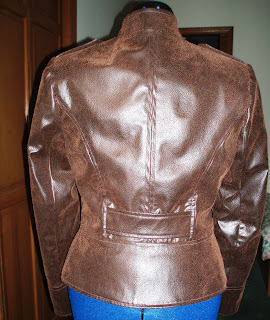 Changes I made to the pattern: Modeling this after the Tory Burch Sgt. 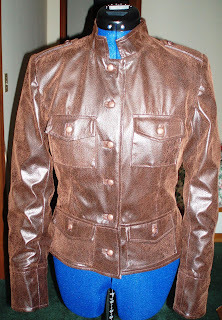 Pepper Jacket, I made breast and lower pockets. I also did bound buttonholes (outside and inside) on the pockets and down the front. I made regular buttonholes for the epaulets, because I thought bound ones would be too thick for such a small piece. 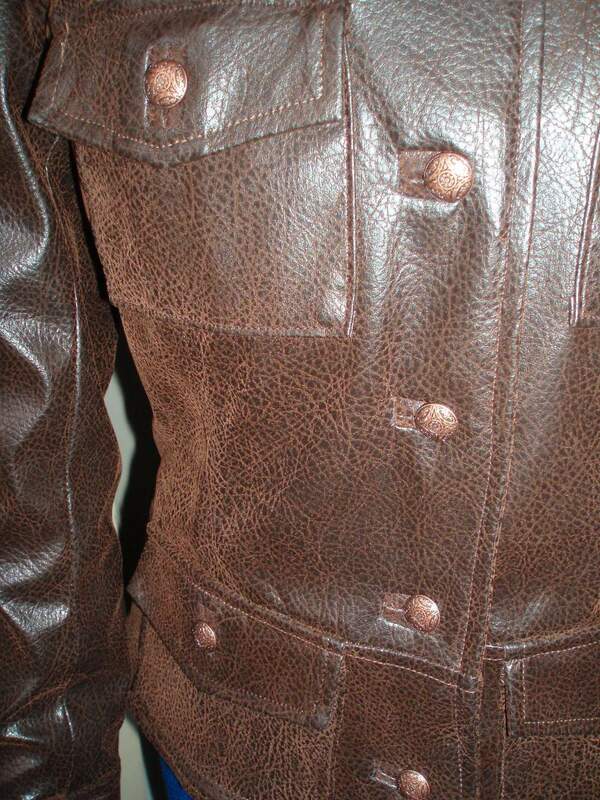 I added some topstitching down the center front and along the bottom edge of the jacket and cuffs. Overall, I am so pleased with this jacket. The time it took to construct and the extra attention to all the detailing were well worth the wait! Sorry about the crazy flash. You get the idea though! I just stumbled upon your blog today and love the things you make! I love to sew and craft, but don't have much time for it right now. What really caught my eye though, was the verse in the sidebar. Love it! I have an idea for you to help with the flash when taking pictures of shiny/reflective items. Cover the flash with a kleenex or piece of white fabric. Play with how much you need. This makes a great diffuser for the flash! I make wedding cakes and do that with them if I don't have enough natural light. Even though the cakes aren't shiny, they appear that way with the flash. WOW!! 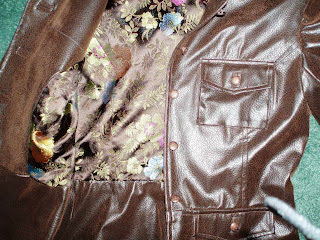 I just found your site your work and this jacket is so inspiring! Girl, that jacket is sayin' something! Amazing. I am in awe. Oh my goodness!! You did a fabulous job!! Freakin' amazing! Very nice job! You did such am awesome job on this jacket! The lining is nice and the topstitching and buttonholes are beautifully done! Wow you did an amazing job, especially the bound buttonholes – not an easy task on the most cooperative fabric. 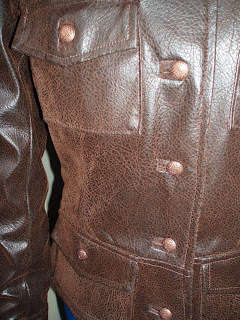 Is it real leather or faux? 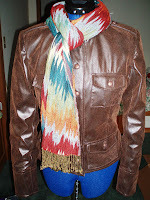 I soooo love this jacket!!! 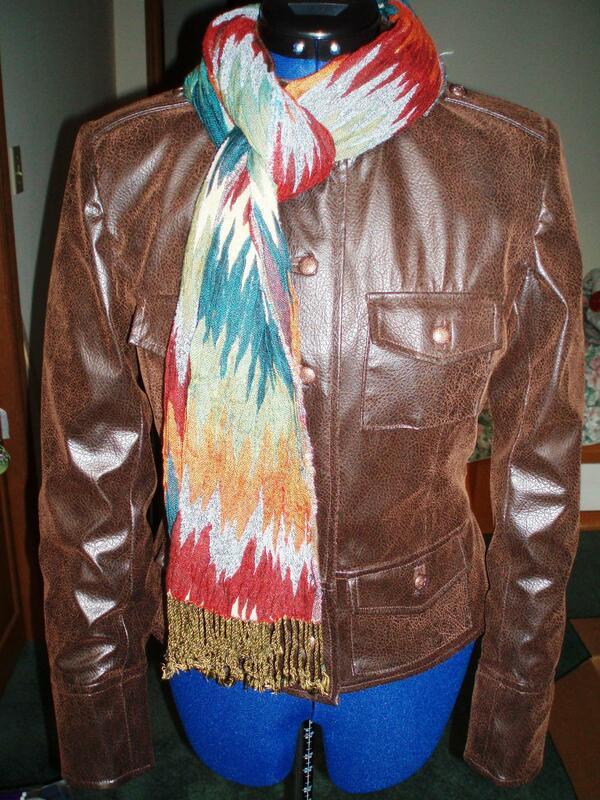 The style is so cool and hip and so in touch with the styles of this fall. The inside is pretty—nice lining. Grat job!!! You did a wonderful job on that jacket, and the lining is oh so perfect!